LOOSE AND LEAFY in DORSET: IF ONLY I KNEW ABOUT FUNGI ! IF ONLY I KNEW ABOUT FUNGI ! My definitions are vague, naive and overlapping. 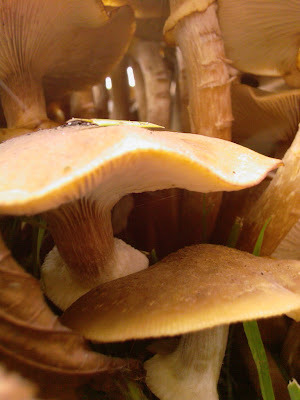 Mushrooms = edible toadstools. 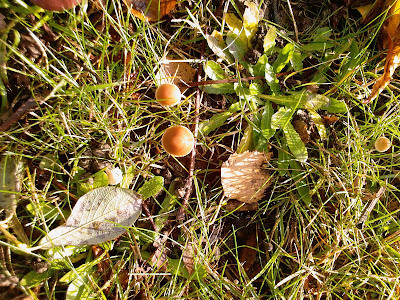 Toadstools = poisonous mushrooms growing out of the ground on stalks. Fungi = things which are neither plants nor not-plants, which may be edible (or inedible) poisonous (or benign) and which grow flat on things or out of things because they don't have stalks. 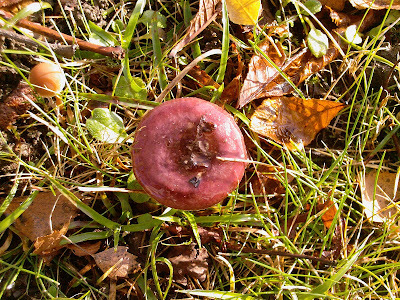 Fungus = nasty stuff which grows where things rot. Hmm. When I went to Frome with Ceres, we found spiders webs over railings and graves. They dripped magically with mist and everyone who came by was immediately struck with awe, moving quietly from web to web. Ceres was the exception. She's always loud. But courting couples stopped to look on in silence. Even elderly people on motorised scooters slowed to seventy for a few seconds. Mothers with toddlers lowered their voices. Even toddlers whispered. 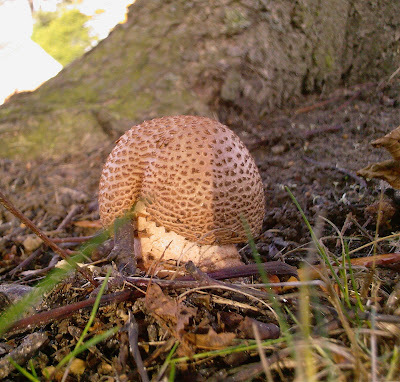 But when I came across toadstools (or whatever they were) in the middle of Dorchester, between a car-park and the main road, there was no awe. The toadstools attracted just as much attention as the spiders webs had done but onlookers were noisy and excited. There were loud 'oh look! 's and noisy announcements that they were probably Honey Fungus. And me saying I didn't know. Doesn't Honey Fungus smell sweet? And weren't there two kinds growing here anyway? (Or were they the same plant-kind-of-thing at different stages of development? Fungi are irritating, like that.) Inside, selfishly, I was panicking. I didn't really mind what they were. I just wanted to photograph them before they were trampled. And I didn't want toddlers to pick them. Hah, I have no clue. I love fungi, and you've found some really nice ones. Wish I could help. Those are great fungi but I haven't a clue either. 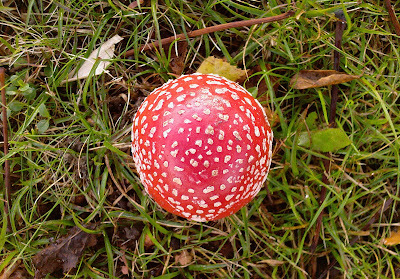 wonderful pictures, especially like the ones of Fly Agaric, they always remind me of the ones fairies and elves are supposed to sit on! Fungi are a complete mystery to me. Not helped by the way they keep changing their appearance during their lifetime. I'm still trying to name the fungi I saw at Wisley. Very distinctive I thought when I took the picture...not distinctive enough it seems. Somehow you make fungi look pretty. Oh, I LOVE the red ones with the white speckles. Just like something out of a fairy tale illustration. How bizarre! The first time I opened this page, the 'post a comment' thingy didn't show. Is that possible, or am I getting even more senile than I thought! Well, now I'm here, I'd just like to say that I don't know what the fungus is, and that I'm absolute rubbish at toadstool identification. 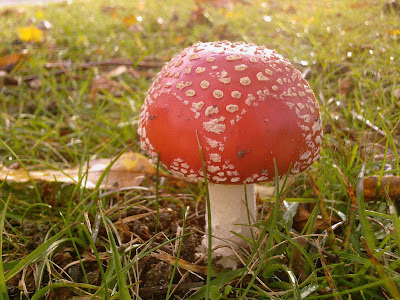 I can do fly agaric - red with white spots - and a few others, but I find it really difficult. The little beggars seem to change their shapes, sizes and colours so much? And that isn't just me. 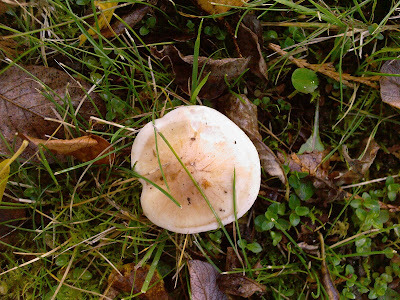 I discovered a beautiful cluster in our mini-meadow last year and sent a pretty decent picture to our local mycologist expert who said 'it's difficult to tell, but I think its a wood blewitt.' Hmmm. And he takes people on guided fungus tours! I guess the moral of the tale is: get out into the woods, and identify them from life. Hi Lucy, such lovely sensual photos. I have a couple of mushroom ID books and have found that there are so many that are similar it would be hard to tell. 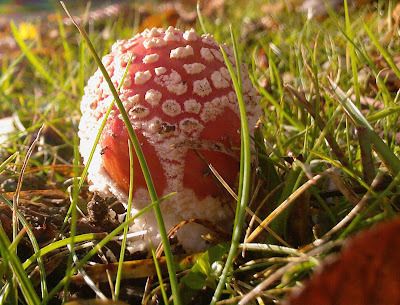 I love to study your photos though and agree with the Fly Agaric, highly poisonous, that one. Glad you enjoyed the first post about fungi. It would have been nice if one of us knew more about fungi - on the other hand, solidarity in ignorance makes me fell less of a thick-head. So that's good! I've just posted the second one - again from the point of view of an unbiased, under-educated but (none the less) fascinated observer. The Fly Agaric (the red toadstool with white spots) may well be the kind we associate with elves and fairies but this particular one looks like a little alien to me. I don't know why there are two gaps in its spots but, to me, it look as if the sweet little chap has big eyes. Thanks for the suggested reading, Dee. I haven't looked into it yet - but I will. And, don't worry Frances and Far Side - I won't be eating any of my finds! What an incredible collection of images!